Excited fourth graders proudly hold their new Saratoga National Historical Park quarters after the ceremonial launch. The small town of Schuylerville, New York, hosted the fifth and final America the Beautiful quarter launch of 2015 on Tuesday, Nov. 17. The ceremonial launch of the Saratoga National Historical Park quarter was held at Schuylerville High School, approximately 1.5 miles from the actual Surrender Site depicted on the coin. More than 1,400 people attended the event, including approximately 500 students from Schuylerville high and elementary schools. Both the auditorium and gym were packed with standing room only. 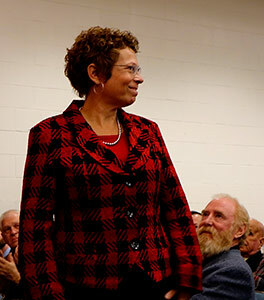 Many special guests were present including New York State assembly and senate members, Saratoga County supervisors, the Town of Saratoga Councilmen and the former superintendent of Saratoga National Historical Park. Western New York resident, Artistic Infusion Program artist and designer of the Saratoga quarter Barbara Fox was also able to attend the launch. She was recognized and applauded by the crowd. The event began with several patriotic songs performed by the Schuylerville High School Symphonic Band. 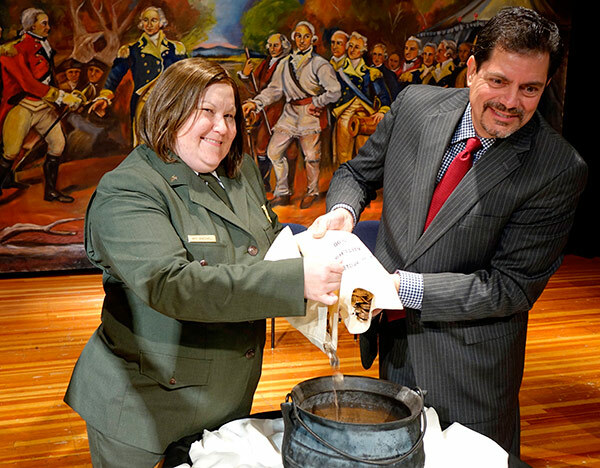 Saratoga National Historical Park Superintendent Amy Bracewell served as the master of ceremonies, engaging the crowd throughout the event with historical facts and thought-provoking remarks about freedom and the significance of this historic day. The Saratoga National Historical Color Guard in period attire posted the American flag, a historic U.S. flag, a historic British flag, the New York State flag and the Department of Interior flag. Park volunteer and high school student McClean Pink led the Pledge of Allegiance. U.S. Senator Kristin Gillibrand sent a letter of congratulations and a message that was read by Amy Bracewell. Regional Representative Matt Scollin delivered a message from U.S. Representative Elise Stefanik, as well. Park Ranger and Historian Eric Schnitzer shared several notable “firsts” associated with this quarter design and the historic surrender it illustrates. The surrender of General Burgoyne in 1777 was the first time in history that the British Army had ever surrendered. In response to Burgoyne’s surrender, Congress declared December 18, 1777, as a national day “for solemn Thanksgiving and praise,” which was our nation’s first-ever official observance of a holiday with that name. The Saratoga surrender is the only military event in U.S. history to have appeared on a coin and a bill – an 1875 $500 bank note. The United States Mint’s representative at the event, Acting Quality Manager Ron Harrigal, delivered remarks about the America the Beautiful Quarters® Program, noting how coins connect us to our history. “This new coin honors the patriots who fought so bravely to defend our fledgling nation and whose victory forever changed the face of the world,” remarked Harrigal. Next came the moment everyone was waiting for: the official launch of the Saratoga quarter! Harrigal presented first day production quarters in a shadowbox to Superintendent Amy Bracewell and then both proceeded to the table for the traditional coin pour. Thousands of quarters were poured into a black cooking kettle that would have been used during the war. Bracewell concluded the ceremony, thanking all guests and bringing attention to the coin exchange and the commemorative sets for sale by the Friends of Saratoga group. Proceeds from the sets go to the park to fund education programs and help preserve the history and site. Glen Falls River Bank exchanged $27,000 in quarters. Albany’s Channel 13 (NBC affiliate) hosted a live feed of the event so other students and the general public unable to attend were able to watch the entire ceremony. During interviews both before and after the ceremony, Barbara Fox told reporters that she chose the sword surrender theme because it symbolized a defining moment in American history and that she really wanted to simplify it as much as possible, so she focused on the hands and the scabbard of the sword.